Several yacht & boat marinas and docks serve Hurghada; originally a fisherman's village on the western coast of the Red Sea; now a major touristic destination for diving, snorkeling, and marine sports. Round-trip land transfers to and from boat dock in Hurghada. All safari and live-aboard boats are 17m or bigger. All boats have decent cabins with beds or bunk beds. Bathrooms are all furnished with cold showers. 9:30am on the first day of the safari to 7:00am on the last day. Schedules are customizable. 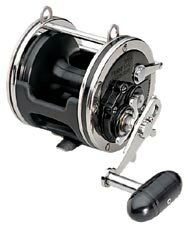 Banax Spinning Reel One fishing set per angler is provided throughout the trip, suitable for both bottom and surface fishing, but NOT for jigging or fly fishing. The set consists of a medium-action boat fishing rod (1.6-2.4m in length) and a convenient spinning reel spooled with 0.4-0.5mm monofilament (approx. 20-25lb test). Also some heavy handlines can be used by those willing to try their luck (and their pacientce!) with big fish (10kg+) on still bottom or shallow fishing. At least two 80-lb sets are usually available on a fishing safari, including reels, rods, and standard artificial baits (lures and/or spoons). In some fishing spots and fishing seasons natural baits are used for trolling (usually rigged schoold barracuda or needle fish). Sometimes live bait is also used. Most boats in Hurghada are equipped with several trolling rod holders, therefore keen anglers who wish to try their own tackle are invited to do so. Light-weight trolling sets are also welcome, especially for surface and shallow trolling for barracuda, bonito, dolphin fish (mahi mahi/dorado), needle fish, etc. Standard lures, spoons, etc are provided for trolling. Moreover, squid lures are also available in a number of colors, in caase calamari show up near the surface, typically after dark. Jigging and poppering gear and lures are usually provided by agreement, not as standard equipment. Snelled hooks used on live-aboard fishing safaris On a live-aboard fishing safari, a diversity of terminal tackle is typically used and/or tried. Recommendation of appropriate hook sizes, sinker weights, types of jigs, etc. depends mainly on the bottom structure of the spot being fished, fish species targeted, size of targeted fish, speed of tidal currents (shallow and deep), etc. Red Sea fishes like natural cut bait--squid, mackerel, and sardine constitute the major or staple baits for still fishing on the fishing trip. At least 2 kinds of these baits are used on a Red Sea fishing safari, according to fishing seanson and needs. In many occasions bait is cut from some certain freshly-caught species; especially sardine- and mackerel-like fish and school barracuda. Small-size snappers and breams can also be used in whole as live bait. Tools and consumables such as fillet knives, needle pliers, scissors, hook extractor, weighing scales, hand rags, etc. Meals are served according to trip duration based on 3 meals per day on full days. The main meals are hot lunch & dinner, using our own just-caught fish. Couldn't be any fresher!. Light snacks avaialbe all the time. Fishermen who are intuitive on small-kitchen cooking are most welcome to participate with additional items of their own. Drink as much as you can: Soft drinks, bottled water, and freshly-brewed hot tea and coffee. It is highly recommended that you also check what you need to bring over or prepare on your own. i.e., stuff not provided by Egypt Fishing. Click here for an overview.